NutraSea Kids is specially formulated with EPA, DHA, GLA and Vitamin D in a yummy taste that kids love! 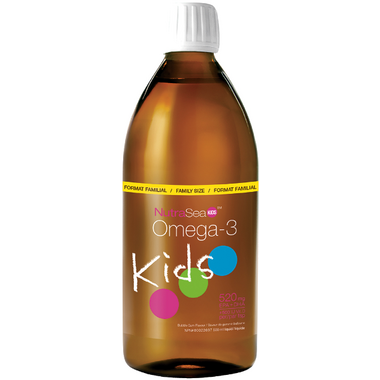 NutraSea Kids is beneficial in the development of the brain, eyes and nerves in children and adolescents. It's also beneficial in the development and maintenance of healthy bones and teeth. Directions: Children 1 to 14 years take 1 tsp. daily. After opening, refrigerate and consume within 100 days. My kids take this fish oil with no complaints. My kid (almost 2 y.o.) loves taking this product, it's never a hassle. As a Registered Dietitian I'm all about that DHA/EPA since we seldom consume fish. Great taste. Both my kids enjoy the bubble gum flavour as it doesn't have the fishy taste that many other brands have. I only give 4 out of 5 stars because my one picky little lady isn't a big fan of the taste, but she still takes this with no issue! My other one on the other hand loves it! The quality is great, and of course the service from well.ca is fantastic! Would order again! My 4 year old loves taking this supplement. My daughter takes this willingly everyday so far. Great supplement! Really happy with the added Vitamin D. Great taste. Both my toddlers love taking this liquid. I love the quality of this supplement. My son asks for it after dinner. He loves it. He seems to be getting less sick when he takes it regularly. My daughter loves this and her pediatrician does too, the added Vitamin D is especially great for the winter months. My child loves this and now so does my husband!! My daughters love this vitamin, and there are never any arguments about taking it. They enjoy the taste, unlike some other fish oils. I will buy again! I wasn't sure how this would go with my kids - but so far they are taking it without any fight ;D I give it to them straight (I have heard of some people hiding it in juice). We take the adult version and are happy that the whole family can benefit from this line. I love the product however my daughter does not like the taste she still takes it. I will have to try a new flavor. Been using this since my daughter was 11 months and she loves it. No issues taking it everyday. She even asks for her "smart" medicine so the taste must be good. I have been taking the adult version for more than a year now and I think it helps with reducing my joint pain. Thought it may benefit my grandchildren. I was afraid they may not like the taste but they love it. Every day they run to the fridge to remind their mother that it is time to get the next dose. This product is great. My 2 year old takes this regularly with no complains or protest! My son favorite omg . He luvs the taste . My son loves the bubblegum taste! We call it "bubblegum time" and he happily takes a spoonful daily. This product is amazing. The kids love the taste, it's a great way to teach them healthy things taste great too! I also love that it's Canadian!